The Lewis & Clark expedition will always be the central narrative of American expansion, as long, that is, as we allow ourselves to feel its imaginative power. Common to this Country reminds us once again of the scientific stature of this great expedition as well as its romantic freshness. 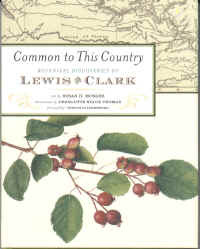 Many of the plants Lewis described and collected, including those featured in this book, are now to familiar to us that it is hard to imagine them being newly discovered. Our gardens abound with plants that have become tame through our constant exposure to them, so that they evoke for us a sense of home, of place, no matter how distant or exotic their origins really were. Cloth-bound, 128 pages, with beautiful illustrations by Charlotte Staub Thomas.